A bit of organisation before you leave home can mean the difference between a tiring, frustrating trip and one that’s fun and far more care-free. Two main principles inform all good packing – pack light, and choose the right kind of luggage. If you usually take eight pairs of shoes and enough cosmetics to open a pharmacy, we’ve got some handy tips for you. Here’s our handy holiday packing list. The wisest travellers fit their belongings into a single bag that meets airline regulations for hand luggage, and that will fit into the overhead bin. This isn’t as restrictive as you might think. Different airlines apply different weight and size restrictions. British Airways, for example, allows passengers to carry hand baggage with the maximum dimensions of 56 cm x 45 cm x 25 cm and a maximum weight of 23 kilograms – as well as a handbag or laptop. However, an ideal weight to aim for would be more like 10 to 15 kilograms. If you plan on buying goods such as souvenirs and gifts during your trip, you can easily purchase a second bag close to the time of your departure, fill it with your purchases and bring it home with you. 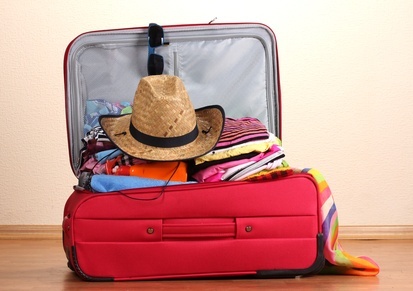 To make sure everything fits, read our top tips for packing hand luggage. Easier said than done, but is is do-able. First off, make sure you pack essentials that could be difficult to find abroad, like prescription medicines. But don’t pack large containers or bottles of widely available cosmetic items, like shampoo and shower gel. Remember, even if you’re travelling somewhere exotic, other countries do have shops! Your clothing needs will differ depending on whether you’re going somewhere warm or cold, and on the purpose of your travel. However, it’s always best to pack mix-and-match items in co-ordinated colours, so you can carry less. For example, instead of packing a top that only goes with one pair of shorts, pack versatile tops that can be worn with a number of other items. Also, focus on packing what you’re normally comfortable and confident wearing at home, instead of carrying lots of newly-purchased clothes that you may not want to wear. An old-fashioned suitcase is heavy and difficult to carry, especially up flights of stairs or through narrow or crowded areas. Instead opt for a roll-on bag with wheels and a handle, a convertible backpack/suitcase or an internal-frame backpack. Also consider packing a lightweight, nylon day bag that you can use when you’re out and about to carry necessities, and a money belt for keeping your passport and money secure. Of course, you’ll have specific things you need to take for your destination. But, when you’re packing for your trip, you can use use our handy check list to make sure you’ve covered all the basics. If you’ve got a long-haul flight coming up, make sure you pack these nine essential items. Nothing planned? Find cheap flights for your next adventure now.